The sun is already streaming in through the curtains when I wake up. I’ve had a good night’s sleep, thankfully. I hop off the double-decker bed excitedly. Today, I’m supposed to meet Monsieur D, who is flying up to Paris from Singapore on his annual pilgrimage. Like me, Monsieur D is a purveyor of perfume, and we have made plans to go around Paris on a perfume-sniffing marathon for a good part of the day. I’m only supposed to meet him at one in the afternoon, so I’ve got some time before that to do some sight-seeing. Perhaps I’ll visit the Musée d’Orsay before walking to the Palais Royal, where we will commence our perfume tour? And then it hits me – I’ve forgotten to bring along a travel adaptor, so I can’t charge my phone, which is running out of battery. As a contingency measure, I connect my phone to my laptop in order to charge my phone. For some reason, I never actually use my laptop for the rest of my trip, so you could say that my laptop was an oversized spare battery. Talk about silver linings! In any case, I have to head to one of the department stores to check if they sell travel adaptors. Perfume grid system – highly organised! Best Christmas display in a department store. My first stop is Galeries Lafayette. Despite coming from London, where some of the largest department stores such as Harrods and Selfridges are, I still marvel at the size of Galeries Lafayette. It is only after wandering through the labyrinth of designer goods that I realise that Galeries Lafayette is composed of a few buildings, which makes it a gargantuan behemoth of consumerism waiting to swallow up the cash of those who walk through its gilded glass jaws. I enquire at their information desk if they sell any travel adaptors, as I had earlier checked online, but I am told that they don’t sell any in Galeries Lafayette. It’s a bummer, but I decide that I might as well check out their perfume offerings. The selection isn’t particularly exciting; all of the brands stocked there can be found in London’s department stores, which do in fact have a wider range of fragrant offerings, with the exception of the Guerlain counter which stocks the Guerlain exclusives usually not found at most Guerlain counters. However, I’d already been to their flagship boutique at 68 Champs Élysées the night before, so I give it a miss. One interesting thing I notice, however, is that each perfume counter is neatly arranged within a grid system, so everything appears extremely orderly. Also, when the French decide to put up Christmas decorations, they pull out all the stops. In particular, I am extremely impressed by the Christmas tree that they’ve put up in the very middle of the building, a tree that reaches almost to the domed ceiling. There is also a dynamic soft toy display that revolves around the tree telling a story as bells, chimes and music play. It’s an enthralling display, and I join the legions of children who are sitting around the tree and marvel at the tree for a good ten minutes. 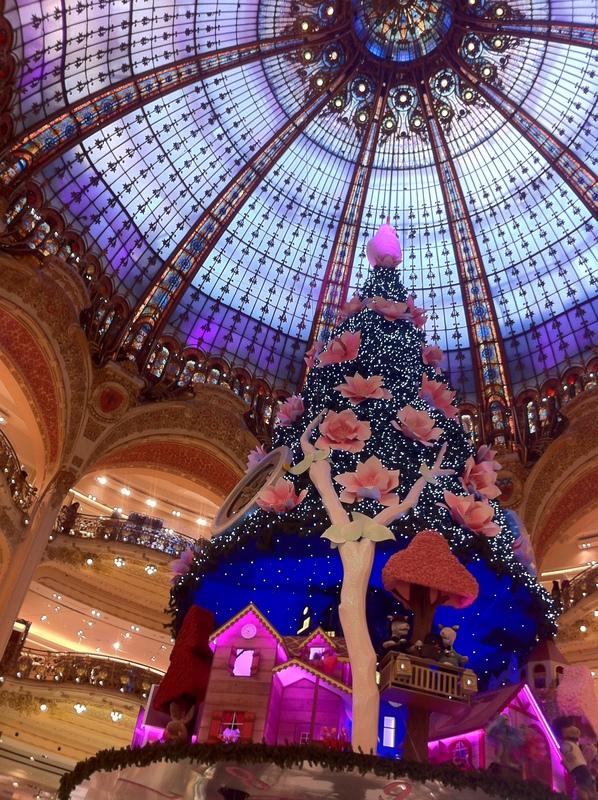 I snap out of my reverie when I remember the reason I first stepped into Galeries Lafayette. I make my way to Printemps, the other major department store that is along Boulevard Haussman, where I am again told that travel adaptors aren’t stocked there either. This time, however, the fragrant offerings are more appealing. I spritz some Profumum Roma fragrances onto blotters, but they aren’t memorable enough for me to note down their names. The Serge Lutens counter, however, is one to behold. Decked out in black marble, it is a sight worth revelling in, and I notice that there are a number of bell jar exclusives stocked there as well. Although I know that Monsieur D and I will be paying a visit to Serge Lutens later in the day, I can’t help but reach for those I haven’t smelt before. I dab on some Miel de Bois, which I’d thought had been discontinued, and find it to be quite a photorealistic honey perfume. It somehow manages to convey the thickness of honey without being too dense and sticky, the sum effect being as though the sun’s rays were filtering through a sheer, translucent veil. It is gorgeous. I have come looking for a travel adaptor, but have instead found a treasure trove of scent. Unfortunately, though, as much as we hate to admit it, some of our needs are more basic than smelling good (although I am sure plenty of you will dispute that! ), and I needed to charge my mobile phone, so it was off to FNAC, which was an electronics megastore that was right around the corner from Printemps. “How am I ever going to find a travel adaptor here?” was my first thought when I stepped into FNAC. It was packed with people shopping for electronic merchandise and all the sales assistants seemed to be very occupied with serving someone else. Not wanting to embarrass myself by having to ask for help in my rudimentary French, I decided to comb the entire place for my travel adaptor. After more than half an hour of wandering around, I still hadn’t found what I was looking for. Thankfully, one of the sales assistants saw me looking very lost indeed and so she asked me if I needed help, bless her heart. I mentioned something about looking for an “adaptateur pour le Royaume-Uni”, and managed to pick out “deuxième étage” and “television” in her response, so I proceeded to the television section of the second floor, where lo and behold, I found what I was looking for! Achievement unlocked! I had managed to survive in a shop without speaking any English, and I am positive that my French teacher from many years back would have been proud of me. And thus concluded my adventure to find a travel adaptor, an adventure which, despite sounding mundane, turned out to be quite exciting after all! As I still had time to spare, I decided to make my way to L’Église de la Madeleine. 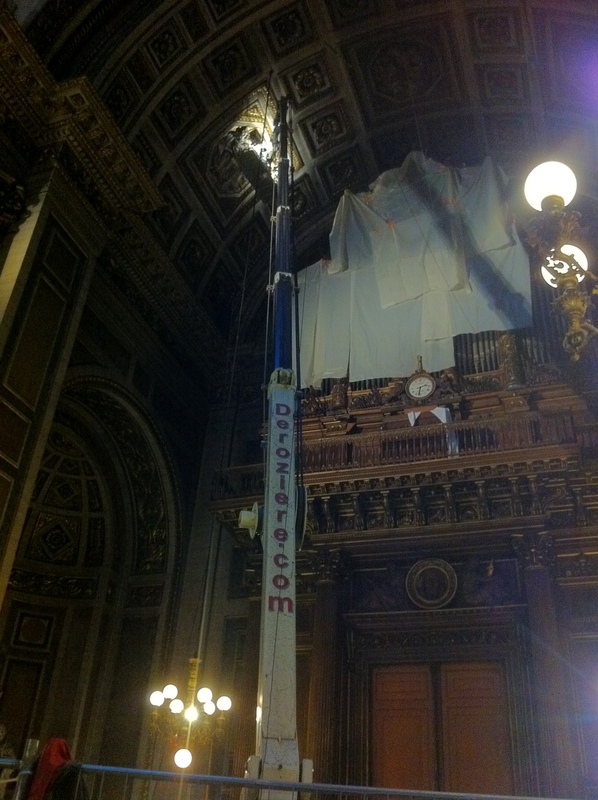 As far as churches go, it wasn’t anything spectacular, but for me it was the first time that I’d witnessed a crane actually within a church itself. I left after sitting around for a while – after some time, churches around Europe tend to look the same as one another, although I’d put that down more to my lack of aesthetic appreciation of churches than to their actual appearance. And that concluded the morning on my second day in Paris… Perfume adventures galore in Part II, because that’s what Monsieur D and I set out to look for! Check back soon! Click here to read Part II of my second day in Paris! The Galeries Lafayette as “a gargantuan behemoth of consumerism waiting to swallow up the cash of those who walk through its gilded glass jaws.” — ROFL. That made me laugh and laugh. So wry, dry, and overwhelmed, all at once. Nice to see you writing again, my dear Vagabond. Thank you for dropping by! I’ve been rather off lately, and lacking in inspiration. And you know I just can’t write without inspiration (plus I lack discipline). But taking time off writing makes me love writing all the more, when I do get back to it. The travel adaptor quest, I know it so well. 😉 Also, back in the day, the country-appropriate modem quest, in those dark dial up days before broadband. The French one was shaped like a horse’s head, strange to tell. Anyway, you did very well to find an adapter in those huge rambling places. And to find a toilet for that matter – McDonalds, Quick, Brioche Doree – anonymous fast food chains, basically – are always a good bet.